Education is a key component to any successful and comprehensive injury prevention program. 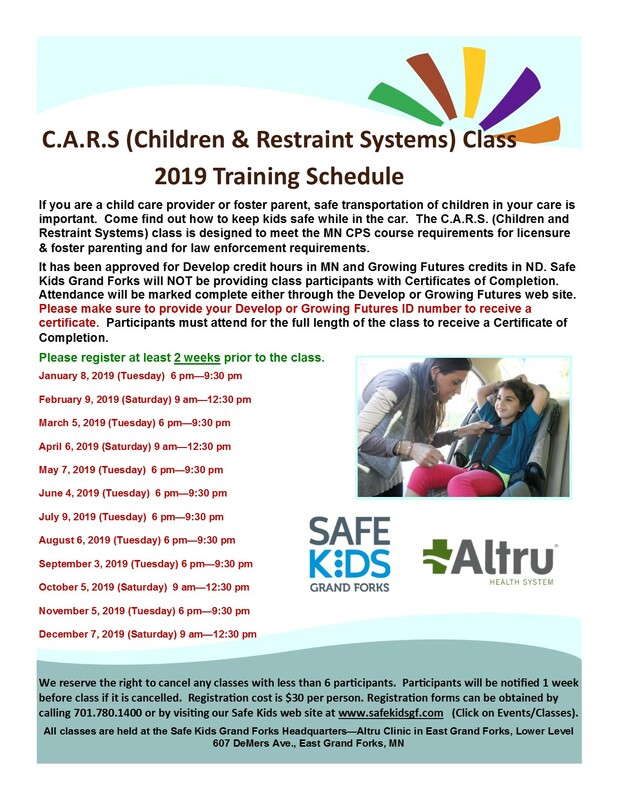 Safe Kids Grand Forks conducts many classes that are geared for parents, children, caregivers, health professionals, law enforcement personnel and many others involved in taking care of children and youth. Below is a listing of our routinely scheduled classes. One-time events will be listed on the Upcoming Events Calendar with a link to the registration information. If you would like to request a training for your business, staff, agency or group, please contact us at any time and we will see how we can provide our services and expertise. Alive at 25 - This 4.5 hour defensive driving course is offered to young adults age 14-25. There are classes offered throughout the year - they are listed on the Upcoming Events calender. C.A.R.S. (Children and Restraint Systems) - This 3 1/2 hour class is designed for foster and child care providers and law enforcement officers. It meets the Minnesota requirement for licensing and for Toward Zero Death grants. The class is offered monthly. Bringing Home Baby- This class is geared for new and expectant parents. It consists of 1 hour of classroom education followed by hands-on assistance in the participant's vehicle to install their car seat. It is offered weekly at various times. 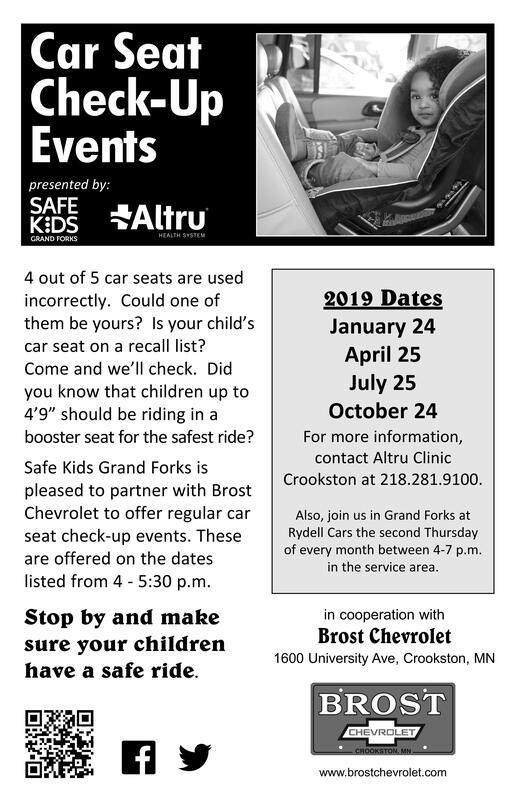 Training Course for Certified Child Passenger Safety Technicians - Each spring/summer, Safe Kids Grand Forks hosts the 3 1/2 day training course for those interested in becoming car seat technicians. This is also offered in other locations in the state from May-September. 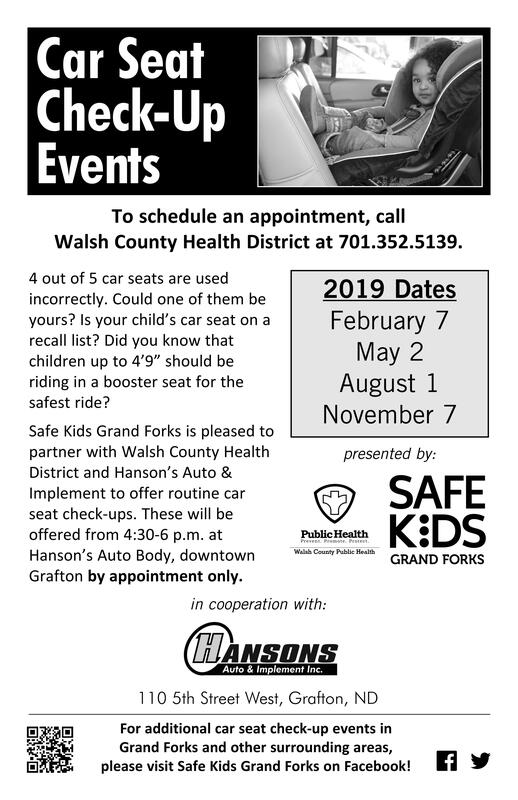 ND Regularly Scheduled Car Seat Check-up Events (statewide)- Several agencies offer regularly scheduled car seat check-up events across the state of North Dakota. Click on the link for a flyer with more information. 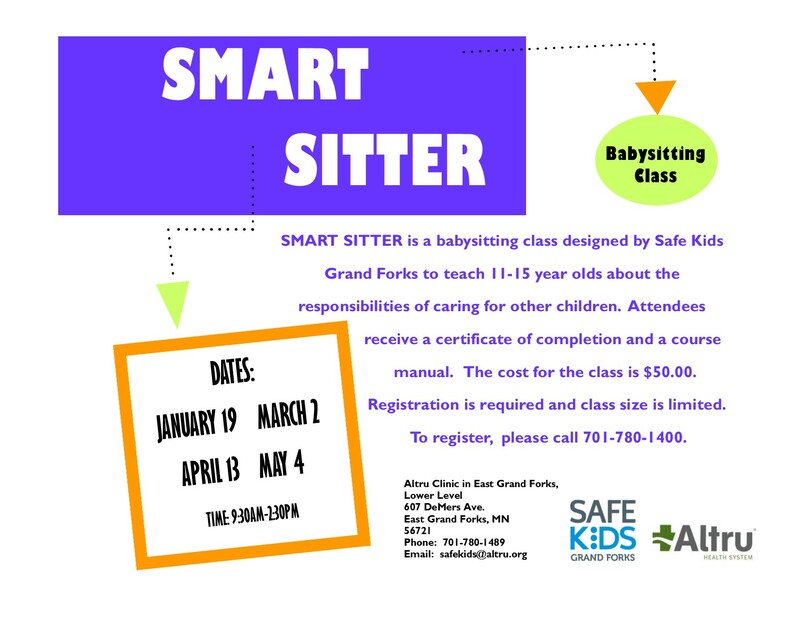 Smart Sitter Babysitting- This class is held periodically in conjunction with Altru Health System. There are classes offered throughout the year. Registration is required and class size is limited. Please call our office at 701-780-1400 to sign up. Home Safety Training - This course is held at least annually by Safe Kids Grand Forks and is intended to train home visitors or agency staff working with clients in their home about ways to keep kids safe in their home environment. Growing Futures credit is available. Safe Kids Top 10 - This course takes participants through the top 10 risk areas that we would encourage parents and caregivers to focus on to keep their kids safe. Call Safe Kids for more details. Kids Don't Float - This is an annual class that is taught in conjunction with UND. We teach 6 classes over a 3-day period of time. The classes are geared for children in the local school systems. Adapted Aquatics Training Course - This course is designed for certified Water Safety Instructors, lifeguards or other persons who frequently work with individuals with special needs (i.e. physical therapists, paraprofessionals, etc.) This course DOES NOT certify attendees as a lifeguard or WSI. It only provides guidance for working with children with special needs in an aquatic setting. Adaptive Aquatics Water Safety Classes- designed as an introductory course for children with special needs who are in Kindergarten - 5th grade to help get them accustomed to water and steps to keep them safe around water. 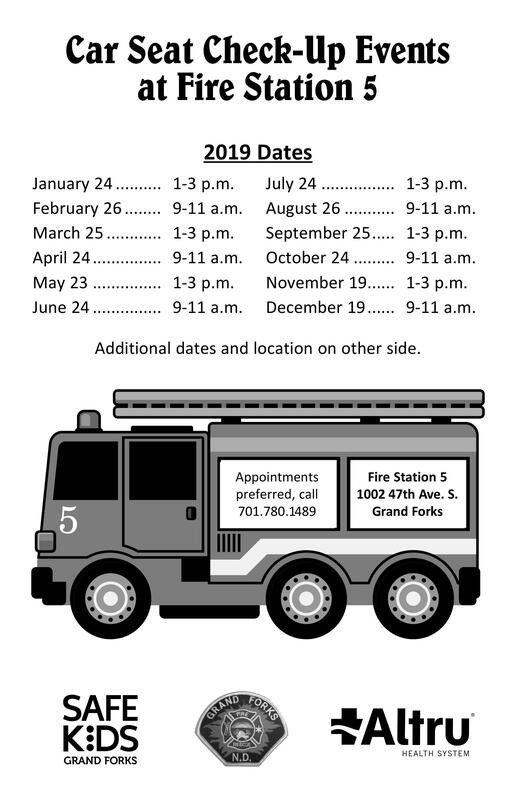 Here is a quick overview of upcoming Safe Kids Grand Forks events. Click on the event title for more information about that activity. 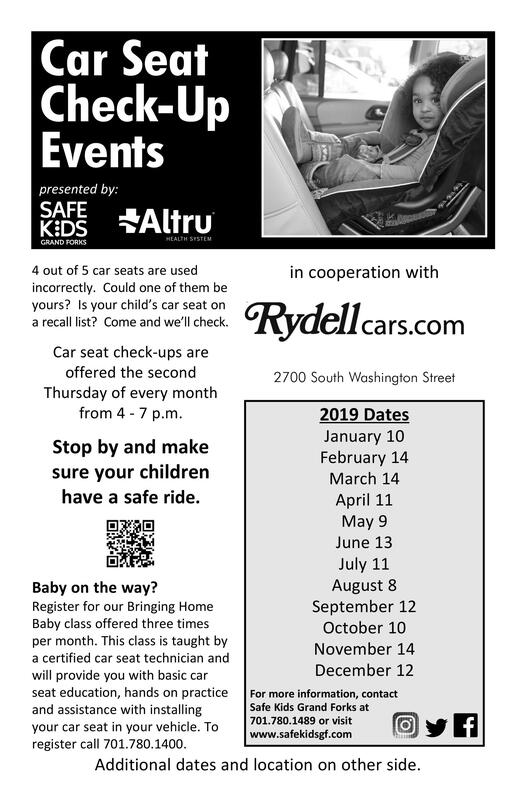 Note: All Car Seat Check-up events are highlighted in green, C.A.R.S. classes are in yellow, and Bringing Home Baby classes are in blue.